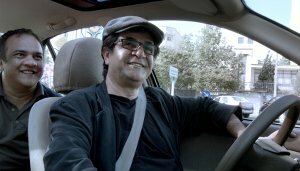 Jafar Panahi has been making feature films in Iran since the 1990s. He got on the wrong side of Iranian censors after the contentious Iranian presidential election in 2009. He was convicted on political charges and sentenced to six years in jail, much of which was served under house arrest. He was also banned from making films for 20 years. The next year Panahi’s made a film called This is Not a Film. After that, he made one called Closed Curtain, about the paranoia under which he now lives. TIFF 2015: TIFF turns 40. Or has it always been there? Each one of Panahi’s fares has a story to tell. The first man recognizes the dashboard camera, assumes it is for protection, and uses it to launch his tirade about the disgusting leniency of Iranian justice. Another fare, a teacher, gets into the back seat and argues with him about mercy. When the man finally gets out of the cab, he reveals his trade, which he thinks makes him an expert on petty crime: he’s a freelance mugger. But he’s not so desperate he’d rob a teacher or a crazy taxi driver who refuses payment. None of the “characters” feel like they are acting, except maybe his precocious niece sometimes, but they almost all acknowledge there’s a camera watching them, and many of them recognize Panahi. Panahi himself is frequently on screen, and he’s usually wearing his “It’s all good” smile. It’s refreshing to see him looking so happy. Panahi’s light storytelling, unsurprisingly, is infused with heavy subtext. The larger story is Panahi himself and the state of culture in Iran. The first passenger to recognize Panahi is the bootlegger, who had delivered films to Panahi’s own house, to his son. The bootlegger loyally argues that culture is far more important than any political decision against an artist. Note that Panahi doesn’t begrudge the bootlegger his work. In Toronto there is always an anti-copyright statement before every film, which shows just how far Panahi is from the mainstream North American film industry. In a later scene he buys some bootleg CDs from a vendor in the street, less for the music itself than to keep culture circulating. When you can’t even get your work to your audience, copyright restrictions are the least of your worries. Two people he meets are aspiring filmmakers. His young niece just had the rules of cinema explained to her at school. The rules are a long list of what is and is not acceptable. Today’s lesson was about what makes a film “unscreenable.” Acceptable is good guys with the names of Islamic saints. Unacceptable is good guys with Western names or neckties, “sordid realism,” or men and women touching. “What is ‘sordid realism’?”, she asks. Panahi loses his smile and looks distressed. The other would-be filmmaker is a customer of the bootlegger; he had ordered entertainments such as The Walking Dead but after realizing Panahi was in the car, he opts for more serious and artistic fare. He asks for advice on making movies, after listing some of his influences. Panahi tells him the books and films he likes already been made. You need to make the next thing, the thing that hasn’t been made yet. Later he picks up an old friend, a red-headed woman who is a lawyer and works with political prisoners. When she gets out she acknowledges the dash-cam. “Don’t think I don’t know what you’re up to,” she says, offering a rose from her bunch to “the people of cinema,” leaving it prominently in front of the camera. The textual ending of the film is ugly; it involves more suppression from Iranian censors. But the framing of the ending is the most beautiful image I saw in Toronto, with the proffered rose sitting perfectly at the bottom of the giant movie screen, reminding “the people of cinema” not to give up, not to give in. When I saw Taxi, it was new enough that some people thought it really was an amazing documentary. No shame in that, though. Being “tricked” by Panahi is no con, it’s just the game you have to play with a filmmaker who’s been banned from making films in his home country.